This is the view the mayor would take you to see. 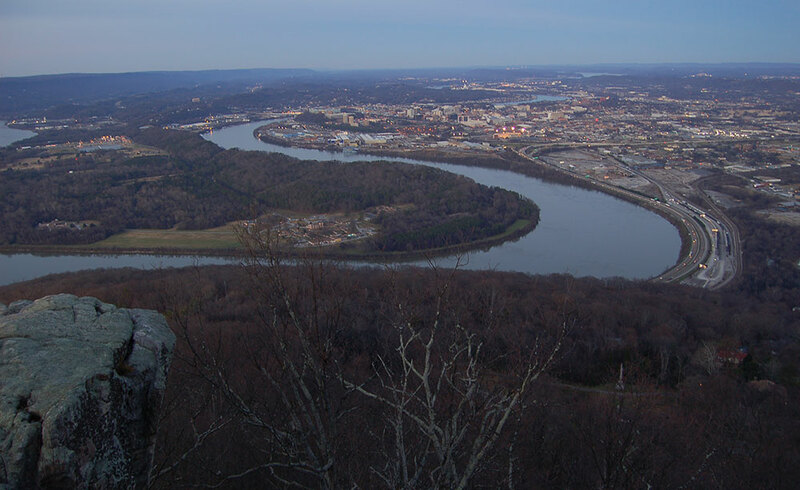 Point Park, with an elevation of 2,135 feet, offers the most famous view of Moccasin Bend and Chattanooga. Whether you have been to the Point once or a thousand times before, it will be worthwhile to visit the oil painting of the Battle of the Clouds in the Visitor's Center, and to walk down to the Ochs Museum and the famous Umbrella Rock. Note: there is an admission fee. The paved loop around the point is accessible to all and includes the famous view of Moccasin Bend and Chattanooga as well as cannons and monuments. Rating: Easy. Bluff Trail towards Sunset Rock is a 3.5 mile out and back hike with spectacular views. Rating: Easy to Moderate. Mountain Beautiful Trail is a less-traveled route along the base of the eastern bluffs with an intimate look at the Incline Railway. Rating: Easy to Moderate.